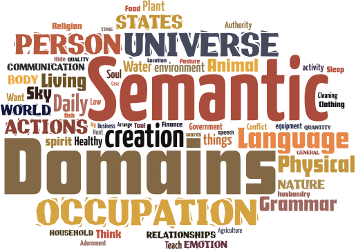 Home » Home » What is a semantic domain? What is a semantic domain? A semantic domain is an area of meaning and the words used to talk about it. A domain is often given a name consisting of a common word in the domain. For instance English has a domain ‘Rain’, which includes words such as rain, drizzle, downpour, raindrop, puddle. We use these words to talk about the rain. The words within a domain are related to each other by lexical relations. Linguists use the term lexical relations to refer to various kinds of relationships that exist between words. There are two basic types of lexical relations. The first type are known as collocates—words that are frequently used together in a sentence. For instance we often use the words bird and fly in the same sentence. Bird andfly are related by the lexical relation agent:typical action. The second type are known as paradigm forms and include relations such assynonyms, antonyms, and the generic-specific relation. The words big and large are close synonyms. Kind and unkind are antonyms.Bird is a generic term that includes the more specific term chicken. As a child learns to speak, he forms lexical relations in his mind. We need these lexical relations in order to speak correctly. Each of us has a mental dictionary which is organized into a giant network of lexical relations. Within the network are important clusters, like cities and towns linked by roads. So a semantic domain is a cluster of words in the mental network. The words within the domain are linked by lexical relations and the domains themselves are linked by lexical relations.